The K60 MCU family includes IEEE 1588 Ethernet, full- and high-speed USB 2.0 On-The-Go with device charge detect capability, hardware encryption and tamper detection capabilities. 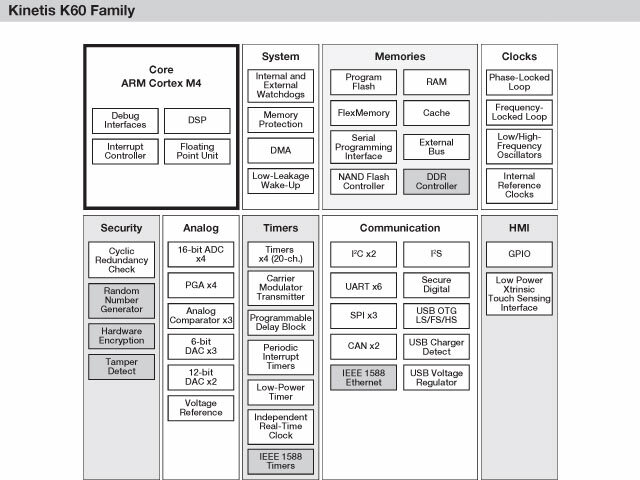 Devices start from 256 KB of flash in 100LQFP packages extending up to 1 MB in a 256MAPBGA package with a rich suite of analog, communication, timing and control peripherals. High memory density K60 family devices include an optional single precision floating point unit, NAND flash controller and DRAM controller.